Hey there! How are things in your neck of the woods? Have a nice weekend? I had a nice weekend, including some sewing time. I set aside my cherries to whip out a little pillow for a gift. I love these little rectangular pillows. It's fun stepping out of the square box you know? This pillow is a standard pillow form 12" x 16" and it was super fast to make. I think I spent more time working on selecting a font than I did making the whole pillow. I love blanket stitching so once I fused the letters on it was easy going. Thankfully I have a lot of tv banked up on the DVR so I can sew away these hot days. Today I'll get back to my cherries. I just need to add the mini inner border and the outer borders then I can quilt it. It finishes up pretty small, so it will go fast. So cute Pam, I am off today so will get a little time in sewing too. Binding on a quilt and then a new one all cut and ready to go up on the design wall. 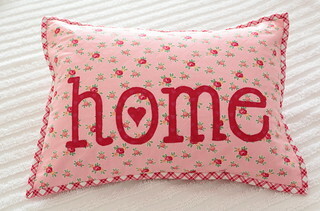 I love this little pillow with the heart in the O. Just adorable. Someone is very lucky! After I get some work done, do my Checker order (just got Lunch Boxes finally) submitted, I need to finish a baby quilt for my itty bitty nephew. He is up to 3 lbs and some change! Still won't be home until September-ish, but it would be nice to have it there for him! Love the pillow. Is that just a font you printed or is it a patttern that somehow I missed?